The Study Group Air War 1939-1945 (SGLO) was founded in 1975 and its main objective is to study the air war over The Netherlands during the Second World War. The SGLO tries to achieve this goal by contacting group members, similar organizations and other experts both in The Netherlands and abroad. On a regular basis our magazine ‘Bulletin Airwar 1939-1945’ is published. The magazine contains articles, ‘questions and answers’ and book reviews all related to the air war over The Netherlands. Twice a year a national meeting is organized in an appropriate surrounding such as an airfield, military barracks or similar location. During these meetings presentations and sharing information are the focal points for our members. The SGLO initiates investigations into specific topics related to the air war during the period 1939-1945. The intention is to publish the results of the investigations in an adequate and responsible way. Thanks to our network, clear results were achieved by our individual members and working groups of the SGLO. As a result of these contacts, the members are able to write articles and books, initiate investigations, organize remembrance services, erect monuments and find missing people. 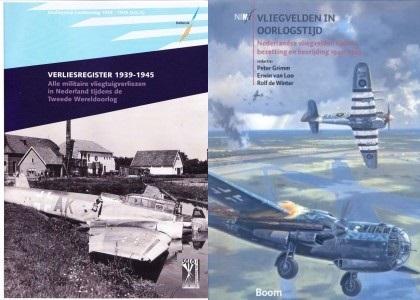 After decades of research the SGLO and the Nederlandse Instituut voor Militaire Historie (Historical Branch of the Dutch Ministry of Defence) were able to publish the ‘Verliesregister 1939-1945’ (Loss register 1939-1945) in 2008. This loss register contains more than 6.000 military aircraft which crashed in The Netherlands during the war. In November 2009 another important publication surfaced: ‘Vliegvelden in oorlogstijd’ (Dutch Airfields during the Second World War). This 500 page book describes the history of all Dutch airfields during the occupation and liberation. This book can now be considered a standard work. It should be emphasized that the SGLO is not excavating crashed aeroplanes. For many years now our activities have been in agreement with the Dutch Ministry of Defence. Thanks to this good relationship, the SGLO has proven itself to be a reliable and independent organization. If necessary, we are able to serve as a knowledge centre for the authorities. The SGLO has approximately three hundred members from The Netherlands and abroad. The members are active service man and women, veterans, historians, aeronautical experts, institutes, museums, etc.